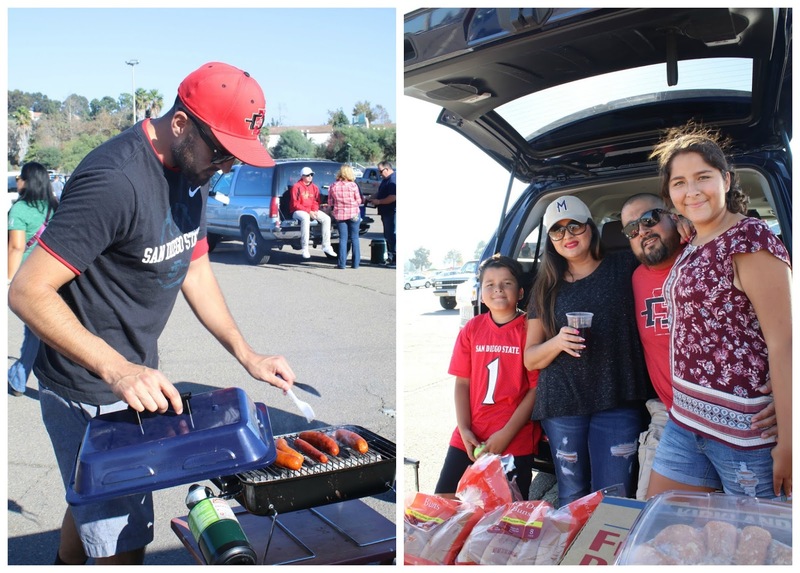 One of the best parts of attending a sporting event is the tailgate par-tay and thanks to Toyota I had the chance to host my own lil' shindig for the SDSU vs. Hawaii game! First thing needed to put on a good tailgate party is a spacious vehicle, in this case Toyota hooked it up with a Toyota 4runner from their fleet that served as seating, shade and became a cool meeting point for my guests. You can never go wrong with food! We served our tailgate favorites: pizza, chips, hot dogs, chocolate chip cookies and a healthy option, a fruit platter (that everyone bypassed when they saw the aforementioned irresistible junk foods). Get everyone in the spirit by decking out the table in your team's colors, in my case it's the SDSU's red and black colors and football themed platters. We brought out our foldable table and our mini grill to prep the hot dogs (which were a total hit), put on some good music and got pumped for the game! We even did the "I believe that we will win" chant and oh boy, did they win! And just in case you are wondering what to wear, I went with comfort and stuck with black since it is one of the team's colors. Here's exactly what I wore: Basic Black Tee, Quay Sunglasses (here), Old Navy Jeans (here), H&M Jacket (here) and Nike Shoes (here). As game time approached, we put away all of our tailgate gear back in the spacious Toyota 4runner and headed in. As many of you know, I am a UC San Diego alumna, BUT we don't have a football team, so I have to stick to my San Diego teams and cheer on the Aztecs! I also hold a very special place in my heart for SDSU, since I married an Aztec... here's me hugging my favorite Aztec! 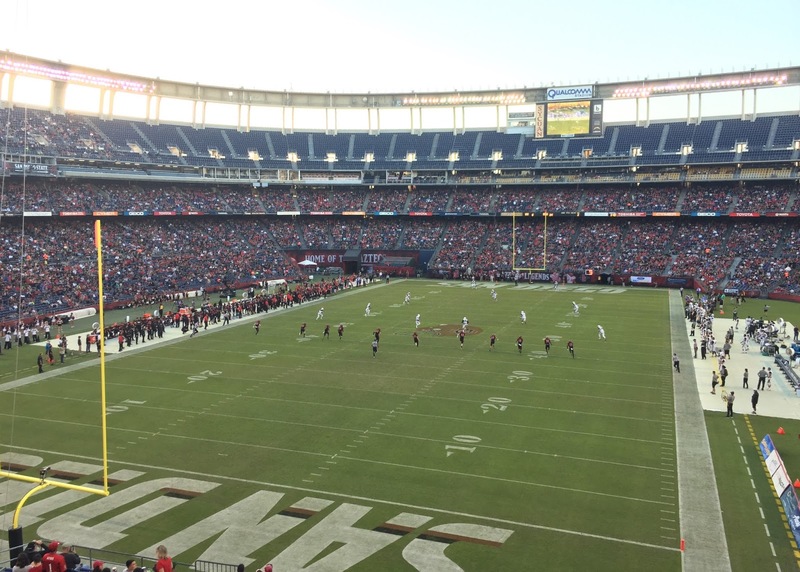 It actually turned out to be SDSU's homecoming game which was extra spirited. Personally I love the band and the dancers so the halftime show was my favorite part. The Aztecs won the game by 50-something to zero (yes you read that right). From the tailgate party to the game itself, it was a fun overall experience and I was so happy to be in company of our dear friends and family. Tailgating Essentials: Food and beverages (i.e. Pizza, Chips, hot dogs, fruit, water, sodas), foldable table and chairs, plates, cups and utensils in the the team's colors, a little grill, portable speaker, your team's gear, a shade tent if needed. Thank you to Toyota for providing tickets, transportation and the experience! Please note that it did not influence any opinions expressed in this post.